WARNING: Progesterone is sometimes used with another medication (a type of estrogen) as combination hormone replacement therapy (HRT) in women after menopause. Combination HRT can rarely cause very serious side effects such as heart disease (e.g., heart attacks), stroke, serious blood clots (e.g., in the lungs and legs), dementia, and breast cancer. Some of these risks appear to depend on the length of treatment and other factors. Therefore, combination HRT should be used for the shortest possible length of time at the lowest effective dose so you can obtain the benefits and minimize the chance of serious side effects from long-term treatment. Combination HRT should not be used to prevent heart disease or dementia. Discuss the risks and benefits of treatment and your personal health history with your doctor. If you take combination HRT, check with your doctor regularly (e.g., every 3-6 months) to see if you still need to take it. If you use this medication for an extended period, you should have a complete physical exam at regular intervals (e.g., once a year) or as directed by your doctor. See Notes section. 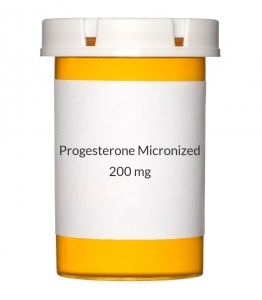 USES: Progesterone is a type of female hormone (progestin). This medication is similar to the progesterone that your body naturally makes and is given to replace the hormone when your body is not making enough of it. In women who are not pregnant and not going through menopause, this medication is used to restore normal menstrual periods that have stopped for several months (amenorrhea). Progesterone is also used as part of combination hormone replacement therapy with estrogens to reduce menopause symptoms (e.g., hot flashes). Progesterone is added to estrogen replacement therapy to reduce the risk of cancer of the uterus. This medication is not for use in children. Progesterone must not be used to test for pregnancy. HOW TO USE: Read the Patient Information Leaflet provided by your pharmacist before you start using this drug and each time you get a refill. If you have any questions, consult your doctor or pharmacist. Take this medication by mouth, usually once a day at bedtime or as directed by your doctor. If you have trouble swallowing the pills, take with a full glass of water while standing up. Follow the dosing schedule carefully. Ask your doctor if you have any questions. The dosage is based on your medical condition and response to therapy. Inform your doctor if your condition does not improve or if it worsens. SIDE EFFECTS: Nausea, bloating, breast tenderness, headache, change in vaginal discharge, mood swings, blurred vision, dizziness, or drowsiness may occur. If any of these effects persist or worsen, notify your doctor or pharmacist promptly. Remember that your doctor has prescribed this medication because he or she has judged that the benefit to you is greater than the risk of side effects. Many people using this medication do not have serious side effects. Tell your doctor immediately if any of these serious side effects occur: unusual vaginal bleeding (e.g., spotting, breakthrough bleeding), mental/mood changes (e.g., depression, memory loss), swelling of the hands/feet, frequent/burning/painful urination, breast lumps, dark patches on the skin or face (melasma), yellowing eyes/skin, stomach/abdominal pain, persistent nausea/vomiting, dark urine, unusual tiredness. This medication may rarely cause very serious (possibly fatal) problems from blood clots (e.g., heart attack, stroke, blood clots in the lungs or legs, blindness). Seek immediate medical attention if you experience any of the following: chest/jaw/left arm pain, weakness on one side of the body, slurred speech, difficulty walking, sudden vision changes (e.g., blurred/double vision, loss of vision, bulging eyes), confusion, sudden severe headache, severe dizziness, fainting, trouble breathing, coughing up blood, pain/redness/swelling/weakness of the arms/legs, calf pain/swelling that is warm to the touch. A very serious allergic reaction to this drug is rare. However, seek immediate medical attention if you notice any symptoms of a serious allergic reaction, including: rash, itching/swelling (especially of the face/tongue/throat), severe dizziness, trouble breathing. This is not a complete list of possible side effects. If you notice other effects not listed above, contact your doctor or pharmacist. In the US - Call your doctor for medical advice about side effects. You may report side effects to FDA at 1-800-FDA-1088. In Canada - Call your doctor for medical advice about side effects. You may report side effects to Health Canada at 1-866-234-2345. PRECAUTIONS: Before taking progesterone, tell your doctor or pharmacist if you are allergic to it; or if you have any other allergies. This product may contain inactive ingredients (such as peanut oil), which can cause allergic reactions or other problems. Talk to your pharmacist for more details. This medication should not be used if you have certain medical conditions. Before using this medicine, consult your doctor or pharmacist if you have: history of blood clots, history of bleeding in the brain, liver disease, cancer of the breast or other female organs, vaginal bleeding of unknown cause, a loss of pregnancy with some tissue remaining in the uterus ("missed abortion"), recent stroke or heart attack (within 1 year). Before using this medication, tell your doctor or pharmacist your medical history, especially of: family medical history (especially breast lumps and cancer), kidney disease, obesity, heart disease (e.g., past heart attacks, coronary artery disease, congestive heart failure), high blood pressure, seizures, migraine headaches, asthma, high blood levels of cholesterol/fats, depression, diabetes, strokes, lupus. This drug may make you dizzy or drowsy. Do not drive, use machinery, or do any activity that requires alertness until you are sure you can perform such activities safely. Limit alcoholic beverages. Notify your doctor beforehand if you will be having surgery or will be confined to a chair/bed for a long time (e.g., a long plane flight). You may need to stop the medication for a time or take special precautions because of the increased risk for blood clots. Ask your doctor for more details. Do not smoke. Smoking combined with this medication further increases your risk for strokes, blood clots, high blood pressure, and heart attacks. This medication may cause blotchy, dark areas on your skin (melasma). Sunlight may worsen this effect. Avoid prolonged sun exposure, tanning booths, and sunlamps. Use a sunscreen, and wear protective clothing when outdoors. This medication may be used during pregnancy only as directed by your doctor. There is conflicting information about whether progestins may cause harm to an unborn baby. Discuss the risks and benefits with your doctor. This drug passes into breast milk. Consult your doctor before breast-feeding. DRUG INTERACTIONS: Your doctor or pharmacist may already be aware of any possible drug interactions and may be monitoring you for them. Do not start, stop, or change the dosage of any medicine before checking with your doctor or pharmacist first. Before using this medication, tell your doctor or pharmacist of all prescription and nonprescription/herbal products you may use, especially of: drugs affecting liver enzymes that remove progesterone from your body (such as rifampin, St. John's wort, azole antifungals including itraconazole, certain anti-seizure medicines including carbamazepine/phenobarbital/phenytoin). This medication can affect the results of certain lab tests. Make sure laboratory personnel and all your doctors know you use this medication. This document does not contain all possible interactions. Therefore, before using this product, tell your doctor or pharmacist of all the products you use. Keep a list of all your medications with you, and share the list with your doctor and pharmacist. OVERDOSE: If overdose is suspected, contact your local poison control center or emergency room immediately. US residents can call the US National Poison Hotline at 1-800-222-1222. Canada residents can call a provincial poison control center. Symptoms of overdose may include severe nausea and vomiting. NOTES: Do not share this medication with others. Keep all appointments with your doctor and the laboratory. You should have a complete physical examination that includes blood pressure measurements and breast/pelvic examinations at regular intervals (e.g., once a year) or as directed by your doctor. Follow your doctor's instructions on how to examine your own breasts and report any lumps immediately. You should also be regularly screened for cervical cancer (e.g., Pap test) and have periodic mammograms as determined by your doctor. Consult your doctor for more details.